I’d never considered that chickens get bored, but now I have them, I realise they do. 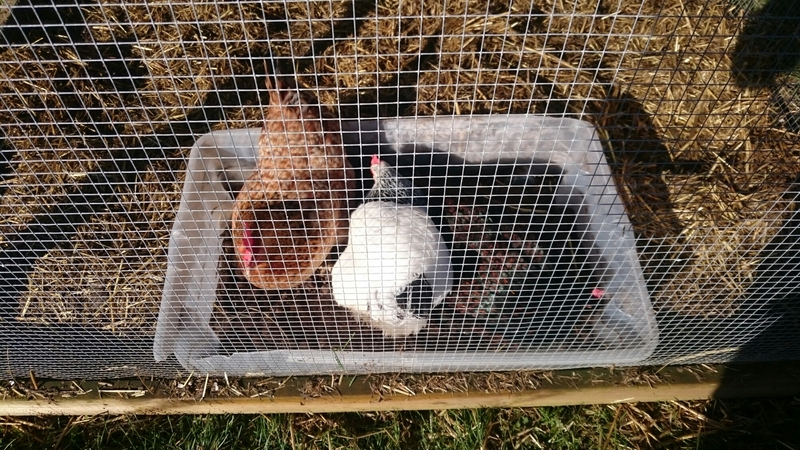 Our girls have a decent sized pen so they can stretch and flap, but they need more than that. They need entertaining. Ever seen your chickens pace back and forth at the side of their pen? They’re bored. Easy ways to make their enclosure more fun is to add height, as they like to perch. We use logs of different sizes. Straw in their pen is another good way of entertaining them. Chuck a load into their pen and they’ll dig through it and throw it around for hours. Once they’re bored of that, sprinkle corn through it and they’ll start all over again! This week, I also added a shallow tub of very dry topsoil. At first they were a little nervous of this new item in their pen, but after a while of ‘plucking up’ courage they investigated it and realised it was full of dirt. After that, they spent 4 hours in there having dust baths, digging around and squabbling over space! Safe to say most of the soil ended up outside the tub by the end, but they had great fun doing it! The same shallow tub idea could work for bark chippings, sand or grass cuttings. The most important thing is to make sure your chickens are entertained and happy. Have fun with them! We bought our 3 chickens last September (2015) at the local county show. We’d just won a chicken house at a show the week before, and thought we’d better fill it. I had considered chickens for a little while, but when we won the chicken house, we decided it was fete and time to get started. We chose 3 different chickens, as we didn’t know which breed would suit us. So we have Snowball, a white Sussex, Ginger, a Rhode Island X Barnevelder, and Barney who is a Barnevelder. You can probably guess which is which in the picture above! What we have discovered, is that chickens have great characters – we had no idea they’d be so interesting. And now, I find myself talking about chickens a lot more than I thought I would. They are very easy to look after and ‘cheap to run’ so I’d highly recommend them to anyone thinking of getting chickens. But be warned, they will destroy whatever patch of lawn you give them, and they are louder than we thought they’d be, so if you have a lot of neighbours you might want to think about if they would complain. When we got them, I also bought the Haynes Chicken Manual. This has really taught me a lot, so I would suggest getting one.